How Do I Moisten a Dried-Up Meatloaf? Meatloaf gets a bad rap in American culture, but it wasn't always that way. During the lean years of World War II, ground beef was relatively inexpensive and breadcrumbs and eggs stretched a little bit of meat along way. President Harry Truman famously called meatloaf and tomato sauce his favorite meal, "Cooking Light" magazine notes. Reheating leftover meatloaf can be a challenge, because it tends to dry out. Dried-up meatloaf is not hard to fix, however. 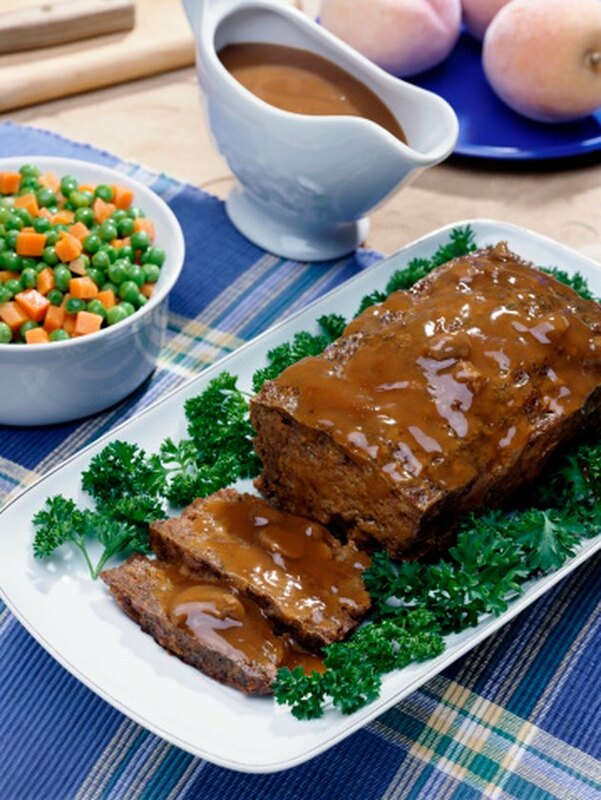 There are several ways to moisten dried meatloaf, so choose the one that works best for you. Spray nonstick cooking spray onto the bottom of a baking dish. Pour a thin layer of tomato sauce or gravy in the bottom of the dish. Arrange slices of your dried-up meatloaf in the baking dish. Pour another thin layer of tomato sauce or gravy on top of the meatloaf slices. Cover the baking dish with aluminum foil and bake the meatloaf for 20 to 30 minutes or until it is hot all the way through. Place a skillet on the stove and heat it over medium-high heat. Fill the very bottom of the skillet with tomato sauce, gravy or water and bring it to a simmer. Place sliced meatloaf in the simmering liquid, cover the skillet and turn down the heat. Simmer the meatloaf for two to three minutes and turn it with a spatula. Simmer the meatloaf for another two to three minutes or until it is heated through. Fill the very bottom of a microwave-safe dish with just enough water to cover it. Place the meatloaf in the water and sprinkle more water on top of it. Cover the dish loosely with plastic wrap. Microwave for one to two minutes on high and check to see if the meatloaf is done. Continue cooking for one minute at a time until the meatloaf is heated through. Place a skillet on the stove and let it heat for a five to 10 seconds over medium-high heat. Place 1 to 2 tbsp. of unsalted butter in the hot pan and let it melt until it is bubbly. Place slices of meatloaf in the hot butter and fry them for one to two minutes. Turn the slices with a spatula and fry them on the other side for another one to two minutes or until they are slightly crisp. Instead of fighting its dryness, this method enhances it. Crumble dried-up meatloaf and add it to spaghetti sauce if it won't moisten any other way. Never let leftover meatloaf sit on the counter or in the oven overnight.